In this article we are going to do a quick introduction to Node.js and LoopBack for Ruby on Rails minded developers. What’s LoopBack? It’s an open source framework for easily developing APIs in Node and getting them connected to databases like MongoDB, MySQL, Oracle and SQL Server. We’ll cover installing Node, the StrongLoop CLI, look at an example LoopBack application plus how to start out on your own. All the while drawing parallels between Node and Rails commands. You’ve likely heard in the past few months that some big companies are starting to deploy Node applications in production and at scale. Walmart is running their entire mobile site on Node, which is currently the biggest Node application, traffic wise. eBay has been running a production Node API service since 2011. PayPal is slowly rebuilding their front-end in Node. Download source or binaries and install manually. Using Node Version Manager (my preferred way). Node has a version manager called NVM which is almost a feature for feature port of Ruby’s RVM sans a cool web site. NVM is RVM for Node. Everything is kept neatly in your user home directory. You can easily have multiple versions at the same time. In the interests of keep this article to the point, I’m going to refer you to the NVM manual for installation instructions (which are pretty much the same as RVM). One of the differentiating factors between NPM and GEM is that NPM installs all packages in the local node_modules folder by default, which means you don’t have to worry about handling multiple versions of the same package or accidental cross project pollution. The modules folder is a core Node concept that allows programs to load installed packages and I encourage your to read and understand the manual on this subject. To help you manage project dependencies Node introduces package.json as a core concept. On the surface it works similar to Gemfile in Ruby and contains list modules that your project depends on. package.json is Gemfile for Node. In reality, package.json is a very powerful tool that can be used to run hook script, publish author information, add custom settings and so on. Because package.json is just a JSON file, any property that isn’t understood by Node or NPM is ignored and could be used for your own needs. This is equivalent to bundle install in the Ruby world. Now that we have covered some basics, lets get started with LoopBack, the open source API framework powering StrongLoop API server. This will install the slc command into your global NPM folder, which, depending on the way you setup Node, would either be somewhere in /usr/local or in your home folder (another reason I prefer NVM). It also installs all the Loopback framework and Devops packages. The slc tool is our gateway for all things StrongLoop. Think of it as rails command, just for Node. You’ll see why in a moment. 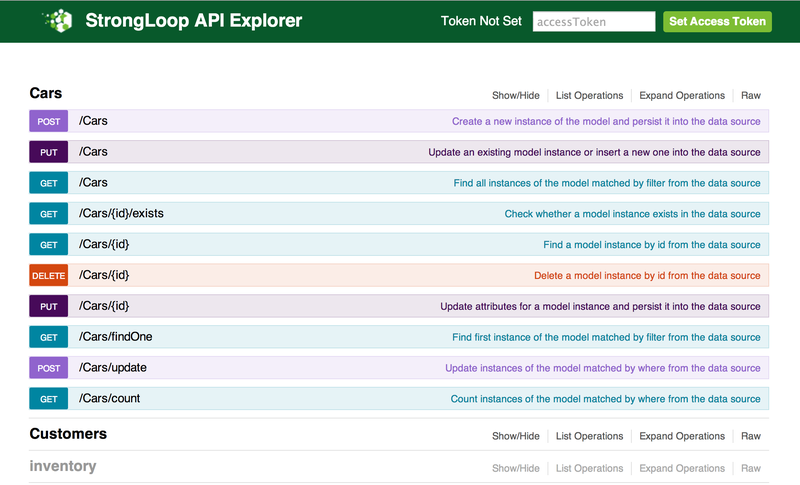 you should be seeing API explorer which comes in a pluggable, but completely separate NPM module called loopback-explorer (github repository). Check out StrongLoop documentation for some additional details about the sample app. This will generate skeleton LoopBack application (hence slc loopback). This is equivalent to rails new myapp. datasources.json stores the backend datasource settings while the config.json has the application host and port settings. Models will be stored as .json files under /common/models and model-config.json retains the mapping of models to data-sources. node_modules contains minimum dependencies you need to get your starter application to run. Lets add some Person properties now. At this point you might be thinking that slc loopback command is similar to rails generate and it is, just not as elaborate at the moment. That’s really all to it, it’s that simple to get started. Check out documentation to get a details on how to expose the newly created model via the REST API and full details on working with models and datasources. Don’t forget to check out the LoopBack.io project home page, docs and GitHub page.